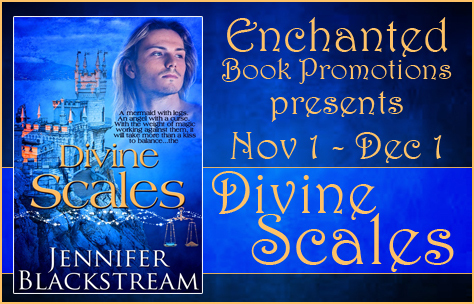 I’m interviewing Jennifer Blackstream, author of fantasy romance “Divine Scales”. My questions are bolded, the author’s responses are in regular font. Writing even when you don’t feel like it. Writing is a lot like exercising sometimes. You need a routine, otherwise days can go by with no progress. Can you give us a short synopsis of Divine Scales? It’s a retelling of the Little Mermaid, so the storyline is pretty well known. I changed a few things to give it my own spin. Marcela’s lost some of her voice, but not all of it, it hurts her to walk, but it’s because she’s never worn shoes, not because of magic, and she is more responsible than her original counterpart. Also, her sudden infatuation with Patricio is due to a curse laid on the angel prince by a witch, not just love at first sight. I don’t really time myself. My daily writing goal is 2k (2,000 words). Sometimes that takes an hour, sometimes it takes four! I’m working on Book One in my new series (a spin-off from the Blood Prince series tentatively entitled Lords and Ladies). Working title is All for a Rose and it’s a retelling of Beauty and the Beast. A warrior with a hunger for sin . . . Driven by a terrible hunger for the black souls of evil men, Patricio, divine executioner of the gods, patrols the kingdom with blood on his hands and ice in his heart. The families of his victims sing his praises–the result of a witch’s cruel curse that condemns him to be forever surrounded by false adulation. When the curse sours the first hint at romance Patricio has had since becoming the king’s heir, his rage is all consuming. Disgusted, he leaves the mermaid in the sea and returns to the palace…only to be shocked when she bargains for the legs to follow him. A mermaid out of her element . . .
Marcela’s world has been turned upside-down–literally. Once a proud member of her father King Triton’s royal guard, she’s now the victim of an angel’s curse. Enchanted into false adoration bordering on obsession, she traded her tail–and her voice–to the sea witch for the legs she needed to pursue the object of her desire. In a cruel twist of fate, the very magic that gave her the means to pursue her passion also broke the spell that caused it. Now she’s in the angel’s arms, but how can either of them trust the desire churning inside them when so much magic has muddied the waters? Trust isn’t easy when nothing is as it seems . . .
A mermaid with legs and no singing voice. An angel with a curse. A witch with a chip on her shoulder. 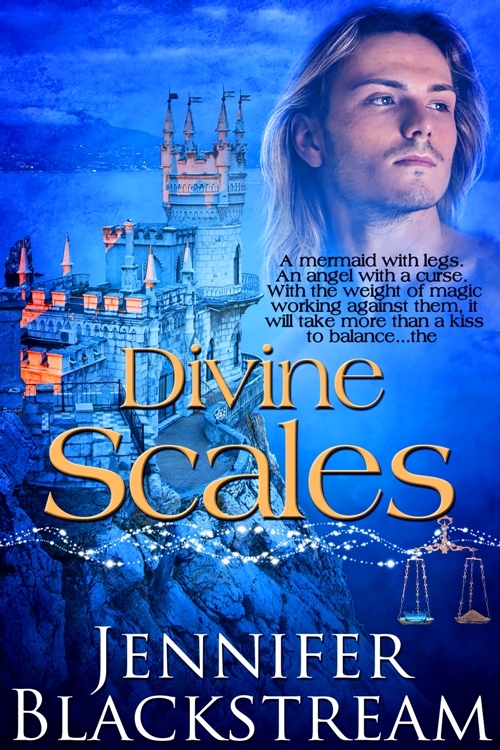 The world is full of magic and mayhem, and for an angel and a mermaid, it will take more than a kiss to balance…the Divine Scales. Jennifer Blackstream is a psychology enthusiast with both a B.A. and M.A. in Psychology. Her fascination with the human mind is most appeased through the study of mythology and folklore as well as any novel by Sir Terry Pratchett. Jennifer enjoys listening to Alice Cooper, trying new recipes (to which she will add garlic whether it calls for it or not), watching television with her family, and playing with her woefully intelligent young son. She lives in Ohio. Jennifer spends most of her time drinking coffee from her X-Men mug and desperately trying to get all her ideas written down before her son can find that all magical button on her laptop to make her latest work vanish. To learn more about Jennifer Blackstream and her novels, visit her website at http://www.jenniferblackstream.com. This entry was posted in Author Interviews, Book Tours and tagged author interviews, book tour, fantasy, romance.